In 2018, we delivered on all our objectives, financial, social and environmental. We have confirmed our 2025 extra-financial targets related to Sustainable solutions, Employee engagement, Safety and Employees involved in local actions. And we have updated our greenhouse gas emissions strategic objective with a commitment to reduce absolute emissions by 1 million tons by 2025. Underlying and restated 2016, 2017 & 2018 information (except for CFROI, and for environmental and social figures). Underlying EBITDA grew organically +7.5% in the last three years, meeting our mid-term targets. Adverse forex conversion and scope effects reduced underlying EBITDA by -2.0% and -0.4% resulting into a +5.0% growth. Volume growth was driven by innovation and increased demand in our key end-markets. Excellence initiatives aiming at offsetting fixed costs inflation supported pricing power. Solvay exceeded its mid-term free cash flow objective, achieving €2.7 billion cumulatively, despite several divestments relative to the scope on which the target was based, which generated €0.9 billion of proceeds. Free cash flow to Solvay shareholders was €1.7 billion, exceeding the dividend pay-out of €1.1 billion. The remainder allowed to further deleverage operationally net debt by €0.6 billion. CFROI improved from 6.1% to 6.9% over the three-year period and exceeds the cost of capital, which firmly positions the Group in the value creation zone. In 2018, the impact of organic growth on our greenhouse gas emissions and intensity has been offset by emission reductions achieved under renewable energy initiatives (0.2 Mt CO2) such as Solvay’s Jasper County Solar Farm and the in-house Solwatt® energy efficiency program. Over the last three years, we have achieved a 24% reduction in GHG intensity, exceeding our target of 20% by end of 2018. Climate change and energy transition are high on the business and political agenda. It is important that future growth doesn’t come at the expense of the planet. In 2018, we have set a new ambitious goal to reduce our absolute emissions by 1 million tons CO2 by 2025 at constant scope. Improve the CO2 footprint of our energy mix through initiatives such as conversion to biomass and renewable electricity sourcing (e.g. : investment in the new biomass boiler in Rheinberg, Germany). Reduce GHG emissions released from our chemical processing operations. Apply an internal carbon price (€25/metric ton of CO2 eq.) to GHG emissions in all our investment decisions. Include GHG emissions metric in senior management compensation. 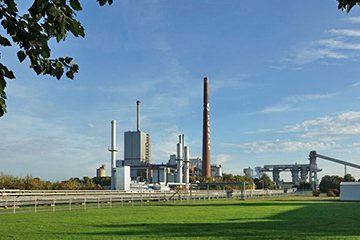 Solvay is investing in a new biomass boiler at its soda ash plant in Rheinberg (Germany). This initiative will cut the plant’s CO2 emissions by more than 30% (minus 190 kt/year) while improving its competitiveness. The new boiler, to come on stream in May 2021, will burn recycled wood waste. 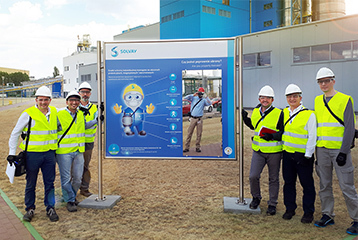 This project follows earlier energy transition initiatives launched at the soda ash sites in Bernburg (Germany) and Rosignano (Italy), thus helping the Group to meet its commitment of reducing its CO2 emissions by 1 million tons in absolute terms by 2025. At the end of 2018, 50% of our net sales were classified as “Sustainable Solutions”. Changes in our portfolio (divestment of less aligned businesses) explain most of the progress; innovation initiatives aimed at developing more sustainable solutions also contributed. Maintain 50% of Group sales in solutions through innovation, organic growth, investment, etc. Circular Economy principles bring new challenges. Solvay’s use of renewable raw materials and renewable energy needs to increase. The Sustainable Portfolio Management (SPM) analysis is embeeded in key business processes at Group and GBU level. It helps analyze the portfolio and allocate resources to upgrade its sustainability. Every innovation, acquisition or capital expenditure project above €10 million is evaluated using the SPM methodology to ensure their contribution to more sustainable and higher growth. We are committed to the circular economy, working together with customers and suppliers to identify opportunities where Solvay can leverage on capabilities, e.g. redesigning products and processes by reducing the use of critical resources, heading towards more recyclable products, helping extend the lifetime of products. 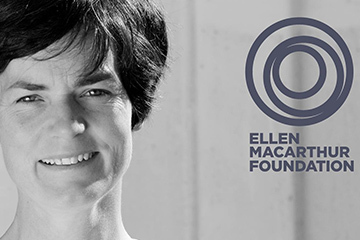 More than 100 Solvay employees were trained on the principles of the circular economy in 2018, while 20 of our experts participated in the Ellen MacArthur Foundation master classes focused on redesigning business models and product life cycles. Launched in 2018 to raise awareness of the circular economy within Solvay, this educational program continues, aiming to foster concrete business projects. One example is how we can redesign our molecules through bio sourcing to help the circularity of the end product: we have developed Amni® Soul Eco, our biodegradable polyamide yarn, with a keen focus on the development of eco-friendly clothing. The number of medical treatment accidents decreased significantly from 50 in 2017 to 42 in 2018, thanks notably to the lessons drawn in the area of contractor management after the fatal accident in 2017 and the rollout of safety leadership training sessions. In 2018, the number of hand and finger injuries was down 20% on the two previous years, thanks to an awareness campaign and best practice sharing. Solvay has made progress on its journey toward “Creating Safety”, an innovative approach introduced in 2017 at top management level. 17 sites have carried out assessments to understand the status of their safety culture. Employees and contractors are being trained on risk awareness and safety leadership. Eliminate all fatal and life-altering accidents. Focus maintained on engagement and safety culture as a way of reducing the number of people injured. This, through Safety Leadership or Safety Climate diagnostics in which we assess the onsite safety culture and discuss with employees. Develop a shared understanding of risks and mitigation measures for the Solvay Life Saving Rules. Pushing relationships beyond business is also a way to better understand our customers’ needs. That’s what Solvay and its customer Bridgestone have done, sharing best practices on safety. “Bridgestone helped us progress. This positive experience helped enrich and strengthen our relationship”, says Bruno Jestin, Global Business Director at Solvay Silica. Openness and trust were the main keywords here. “I wanted to combine the visits with meetings between our safety managers, to create a local network and encourage exchanges on all levels. We found we have a lot in common with Solvay on these subjects – not just regarding safety, but for business in general” explains Fabrizio Paletta, Head of Health & Safety at Bridgestone EMEA. Employees express engagement and satisfaction at work through the annual “Solvay Employee Survey”. Record participation rate of 87% in 2018 (vs. 81% in 2017); survey recognized by leaders as a valuable management tool to engage their team. Satisfaction and pride remain high: top scoring items are sustainability, innovation and safety, showing that they are embedded in Solvay’s culture. Key areas for additional attention are digital transformation, agility and people recognition. To strengthen collaboration and empowerment, new ways of working have been implemented, leveraging digital tools such as the new YOU HR tool that allows employees to manage their profile, development and performance appraisal. 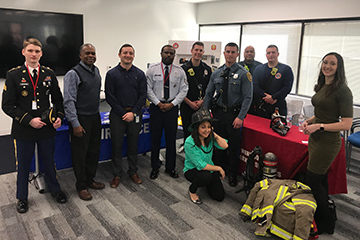 Work-life balance and stress prevention is a key area of attention: the Group is implementing a Well-being@Work program across sites or entities. Diversity & Inclusion, still high on the Group’s agenda, focus on three areas of action: fostering awareness through workshops and local actions; developing an inclusive culture; challenging HR processes. Drive cultural change across the Group to increase customer focus and collaboration. Improve the Group’s methodology in recognizing employees’ performance. Increase inclusion and wider diversity in our teams. Commitment by Businesses, Functions and Sites to take action in relevant areas. Stress prevention and management: more extensive support will be available on sites. With the aim of accelerating the development of Asian talents, the Asian Talent Council (ATC) was formed some four years ago as a collaborative platform, sponsored by Hua Du, member of the Executive Committee, and driven by the GBUs operating within the Asia-Pacific region. The ATC has identified and assessed high potential employees nominated by GBUs and Functions, creating a talent pipeline within the region. 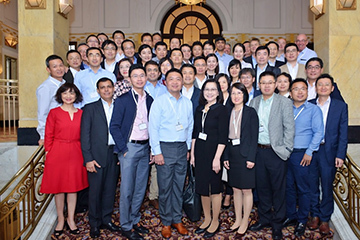 Recognizing that talents are a Group asset, the aim of this pipeline is to feed candidates into the Group’s global senior leadership development programs and at the same time to further develop strong local leadership to drive growth in Asia. Various initiatives have been developed, e.g. dedicated workshops, mentoring programs. 87% of Solvay industrial sites have a working group that defines the relevant societal actions to be undertaken to respond to the major issues in the region. Solidarity and Youth employability are the main areas for these local initiatives with no significant differences across the regions. Measure the real impact of Solvay’s local societal approach without excessive reporting burden. Embark and focus Solvay’s employees on the four key topics: science, youth employability and education, environment and solidarity. As part of the Solvay Way practices, all sites self-assess annually their progress with regards to their approach to societal actions. In 2019, we will launch of a Solvay Award for outstanding societal actions to recognize, share and promote best practices. 27 Solvay employees in Princeton (USA) have become mentors for local school children through the Big Brothers Big Sisters non-profit organization. The “Bigs” (Solvay people) aim to help the “Littles” (the students) learn life skills, avoid risky behaviors, gain greater confidence through a positive, strong and enduring relationship with an adult mentor, and so recognize their own potential and build their future. 24 Littles visit the Solvay site twice a month during the school year, spending one hour on learning a life skill and a second hour on individual mentoring with their Big.